1. Engage- Find a meaningful way to reach your learners. Identify colors, symbols, and a motto that supports the yearlong learning theme. Allow this inspirational concept to reach learners from all avenues. Use this theme to connect learners’ thinking and experiences across the content areas. Infusing a foundational concept that motivates students to rise to the occasion will make an incredible difference and establish the tone within your learning community. For example, we have chosen to use trees as a metaphor for our students’ growth this year. 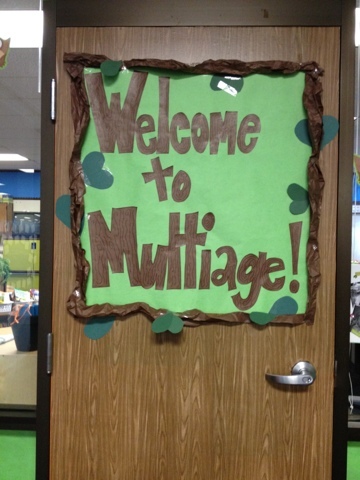 We have decorated our classroom with blue, green, and brown tones to create a calm and homey feel. Our classroom motto of “Work Hard, Be Courageous, Celebrate Growth” is a direct link to our collective growth mindset. There is also a large banner on the wall outside our classroom that states: “Learning is Growing!” Working with this idea, as we each measure our own growth toward our personal goals this year, we will constantly make connections to our self as a seed planted into our classroom environment, being nurtured each and every day during the learning process. Our students are not only focused on their own personal achievement, but rather the entire forest of learners. 2. Connect- Meet your students where they are. Take the time to get to know each individual. An understanding of their academic strengths and challenges should be balanced with a knowledge base regarding their personalities and interests. Consider specific entry points that will capture their attention and allow them to make authentic personal connections to the classroom community’s learning theme. Establish a daily routine with significant rituals that build camaraderie and celebrate the diversity within the Student Learning Community. Each morning we meet our students in the CC, the Community Center, of our classroom. This is the space where students come together as learners to partake in daily rituals. Each morning starts with a Brain Breakfast. As each child enters the CC and meets with their peers, they are focusing their brains on thinking critically and creatively with a prompt that varies from quotes to poems, to songs or pieces of art, but always links in some way to our process of learning, communication and infusion of information. Here, students take time to reflect and connect to the prompt, then turn to discuss with a partner before sharing with the whole group. This ritual is so natural and welcoming to our students that they often suggest quotes and create art to inspire future Brain Breakfast prompts. Each discussion allows the students the opportunity to share their creative thinking, to make connections to like and unlike concepts, and also to be heard, appreciated and supported by the community. 3. Personalize- Allow the environment to rise up and greet your students each day. This space should be their home away from home, truly providing a comfort in resources that will meet their personal needs. A foundation should be established for the development of independence by way of individual goals. Each child should have a personal map to guide them along the path of their learning journey. Daily experiences should motivate them to celebrate their strengths and attack challenges. Above all, your students should deeply feel and believe in your promise of providing them a personalized learning experience. Celina and I believe in a Students First approach, where the classroom goals and expectations are centered on meeting students where they are, providing what they need to move forward with success. This means we have created a classroom that celebrates individual strengths and differences, which develops a disposition within our students of self-direction with their learning. Students set goals around their own needs and access a variety of resources suited to their own learning style and level of understanding in order to build on their knowledge base. While goals may be similar between students, the ways in which they need to gain that information are entirely unique to each child. Large and lofty standards and essential questions are often posted to expand the sense of direction and possibility within our classroom, and to connect student learning to the larger purpose of collective understanding. Daily experiences within our classroom encourage students to share and relate to their peers, learning from them and teaching as necessary. Around our classroom displays of their artwork add color to our room, rather than commercial posters or pre-printed materials, so that students see they are valued. They are the reason we are here! 4. Empower- Embed the 5 strategies of choice, reflection, self-assessment, students as teachers, and voice in all aspects our your daily routine. Inspire students by allowing dependable rituals to exist, but ones in which their thinking is stretched and enlightened by engaging processes. Provide unlimited opportunities for students to take charge of their own learning and design plans and activities that help them reach their own goals. Students must feel that they direct the learning process, which is essential to independence. Celina and I guide rather than direct. We know that the best learning comes from finding the information on one’s own, connecting to prior knowledge (which is different for each child) and being actively engaged from the beginning to the end. By enabling our students to choose their resources, goals and learning path, they are empowered to "own" the learning. Routine reflection helps our students to learn from each other and be critical thinkers of their own process. Self-assessment keeps students accountable to their personal goals and active in their responsibility as a learner within our community. Students take a dynamic and engaged role when they have the chance to teach their peers and community members about what they are learning. They use their voice in positive ways to expand the knowledge of others and to be recognized and included in the community. Lifelong learning is a process of empowerment, but the seeds of it start now with the learning experiences students experience when they are young. 5. Believe- Take a step back, genuinely let go, and believe. They will ultimately rise to the occasion when they have been inspired to be themselves, and when a solid platform has been built to allow them to stand strong. A real sense of trust develops when you have provided a variety of resources, and then you allow those options to be accessed with their own discretion during the learning process. A huge part of trust is when students know you are there to catch them when they fall. So step out of their way, but do so with your arms wide open. It is often said that high expectations provide top-notch results and elementary classrooms are no exception. When children feel that their unique needs and styles are allowed and appreciated they can begin to find their own true voice and move forward with confidence. This required Celina and I to step away from the traditional model of teaching we had used in the past. No longer are we the fount of knowledge within our room. We became the “active guides at the sides”, encouraging and cheering our students on to greater levels of trust within themselves as learners. Our classroom is often a busy hive of chatter as our students are continually communicating and challenging each other to grow. Students are thinking critically about what they are learning, their approaches to accessing information, and their direction in terms of the overarching standards and essential questions. They think creatively in ways to solve problems, connect their understanding and showcase what they know. They collaborate constantly, from teaching each other, working in groups, creating team projects or supporting each other in learning. Establishing a thriving learning environment is instrumental in students obtaining personal success. We must be strategic in how we develop our classroom communities at the beginning of a new school year. The setting must support the whole child, adapting to the needs of the group as everyone settles in for the yearlong learning journey. The environment must specifically be designed to support the health and safety of our students, strengthening the emotional well-being of each individual. While providing an atmosphere that supports learning endeavors from every angle, students can be offered many opportunities to be truly engaged and challenged. But how do we guarantee that we WILL develop a solid foundation that supports the whole child? Yesterday, Celina and I had the opportunity to share what we do in our classroom with others at a presentation for empowering learners. We spoke about the 5 powerful strategies that are the basis for our program: choice, reflection, self-assessment, students as teachers, and student voice. The 4 ½ hour return trip was spent laughing and reflecting on all that we have been able to accomplish with our students in the last year and half. How we have grown as teachers, how our students have grown and how our program has evolved into creating an environment for learning that could work in a multiage context or any straight grade setting. Why does it work? It is a mindset, a way of thinking. It is not a canned program or a prescription, it is about starting with the students first, considering what they need, and focusing solely on all of the ways we can meet those essentials. We start with our students, determine the standards they require, and then pull from our curriculum and other resources in order to meet those needs. No matter what the standards are, or what the curriculum is, you cannot make it happen without starting from where the kids are and what they still need. Thinking in this manner, with this mindset, means that the standards and curriculum you work from are basically irrelevant! They just become a set of “building blocks;” they are those elements that you scale on the path to becoming an accomplished learner. We started our program last year with the state standards, but easily transitioned to CCSS when they were put into use. In the past few years our district has implemented new curriculum in Art, Social Studies, Math, Spelling and World Languages. While this could have easily overwhelmed us, we instead chose to look at these materials as just a new set of basic resources from which we could pull (or our students could seek) the knowledge that was needed. We pass this mindset on to our students. The realization that they can achieve anything they set their minds to, they can grow from where they are, take charge of their learning, and be empowered in their abilities and choices. We returned today to our classroom tired, but exhilarated and eager to share and celebrate with our students all that we have experienced, shared and received in response. Our students were so proud, so happy that their Brain Books were shared, so excited that “THEY” were our topic of conversations. Overall though, I felt awe in them and from them, the awe in knowing that their words and work have the power to transform education for all the administrators and teachers who were at our presentation and eventually all the students who will be impacted by this new learning. They have the power to change the world for others as they have changed it for us. It starts with the students and the learning never ends. PS Thank you to "our people" for making it possible! One of my favorite shows is Grey's Anatomy, and I have always appreciated the relationship between Meredith and Christina. I love how they genuinely use the term "my person" with one another. We all need "a person" or "people" by our side as we travel our journey. Usually the people in your life you are closest to are traveling a parallel journey as you in someway. Sometimes that may be because of hobbies, fitness goals, children, or work. Regardless, we should pay close attention to the positive energy these people bring us. They should be our champions, as we should champion them. Our people make it possible to keep our head above water as we strive to achieve our goals. They bring humor and laughter to our lives in bucketfulls. They also help us to recognize our character and keep us accountable and on track. I am surrounded by amazing individuals on a daily basis; my people. Unconditional acceptance is available, as they know my authentic character. I feel comfortable and confident in their presence. They listen and offer sound advice, helping me keep negative energy at bay. I trust them with my whole heart. Our philosophy in a nutshell... Which has been on our minds a great deal lately, as we explain the approach to learning within our classroom at the beginning of this new school year. Ann and I are very dedicated to STUDENTS first in our general planning and sequencing of lessons. As we are now moving from an individualized teaching approach to a personalized one this year, we are diligent about providing students with individual goals that also match their interests and learning styles. Daily formative assessment guides our decision making and flexibility in our differentiated approach to planning; adjustments are made moment to moment as necessary. STANDARDS fall second in our planning approach. After discovering the individual needs of our students we align their needs to the standards, this year having to go between our current state standards along with CCSS. We teach our students that the standards are like building blocks, and sometimes their skill level is beyond or behind their "grade level" expectation. Ann and I help them recognize and develop an understanding of this continuum, so strengths and challenges can be taken on with a positive growth mindset. We promise to meet their personal needs as a learner, wherever that may be on the continuum, and provide them with a plan that best fits them. Falling third in our approach is the CURRICULUM/RESOURCES available to us within our classroom, physically and digitally. We search for and provide our students with materials that will guide them on their journey, supporting the particular standard of learning they are ready to conquer. For years we taught from the curriculum first standpoint. We diligently used our curriculum guide to design our weekly/monthly/yearly plans. Fidelity of the curriculum was important to us, and the next year we would dig our our lesson plans and follow a similar routine. As we taught we labeled the standards we were "hitting", checking them off as they were covered. And at the end of a chapter or unit we would assess how our students did with the material, recording a grade, and then we would move everyone along following the curriculum plan. A few years back we become more conscious of checking the curriculum ahead of time and giving ourselves permission to skip lessons and activities that did not cover our standards, and then found supplemental resources to cover standards that were not addressed in our adopted curriculum. Along the way we become more aware of differentiation strategies that would assist students in attacking the standard by providing different entry points or providing them with a variety of ways to show mastery of their particular grade level standard. We were still recognizing, though, that we continued to struggle with meeting the individual needs of many of our students, especially those behind or beyond the grade level standard at hand. As we approached our second year in multiage, we were thankful for having the opportunity to "let-go" of the single grade focus last year. We approached this year with an even bigger openmind and an even clearer perspective on how we would approach our daily plans to ensure meeting the needs of our students. Our planning continues to be student driven, providing many opportunities to allow students to access learning through a variety of modules that match their interests and learning styles. We plan according to the standards that need to be addressed, continuously using assessments to point us in an accurate direction. And we have intentionally pulled in a variety of curriculum materials, to have at our fingertips, that will assist us in meeting K-8 standards. Teaching within our Multiage Program has allowed us to stray away from the one-size-fits all approach to learning and intentionally meet students where they are on their learning journey. Students first, then standards, then curriculum- a mantra worth considering. A Wonderful Year Has Kicked Off! The new school year is in full swing for Ann and I, and we totally cannot believe it is already October. The first month of school has come and gone, with amazing learning already documented. We have 54 students this year, learning and teaching along side of us each day, along with 2 amazing student teachers who join us several days a week. It is a full, busy place to be- but we are so happy and wouldn't change a thing! Our first days were a dream come true as our 22 returning students greeted us with giant smiles and big hugs on the first day, quickly settling back into their home away from home, and immediately taking on leadership roles to welcome our new community members. We have remodeled our learning space and have settled in nicely to our reorganized, redesigned, revamped environment. We took the advice from our students last spring and made their ideas a reality. Ann and I also enjoyed researching and reading a ton this summer to expand on our teaching philosophy and enhance the learning inside and outside the walls of our classroom. One thing that took awhile to get rolling this year was HOMEWORK. I just had to laugh today when the kids CHEERED that we finally had it ready, because in our neck-of-the-woods we use PBL to guide our homework. And this year we our calling them Passion Projects, inspired by the book: The Passion Driven Classroom. The students choose a topic of interest to research through the month (at school & home), create a project, and then share at our Passion Project Celebration- in which invitations will be extended to our families. The students were buzzing with ideas today as they left the classroom. Our goal is to intentionally extend the learning from the classroom and encourage students to build on their interests, while engaging families in the process. Real learning at its best!